So you have come to unpleasant conclusion that you are the toxic one. Up until now, you thought everyone else around you was toxic. Up until now, you felt you were justified in your behavior because you felt that you were the one being victimized. Yet, with each passing offense, you could feel your anger rising more and more. They all kept doing things that made you feel like you weren’t good enough or that you were not being treated fairly. Until you came to the realization that it wasn’t them who changed. My friend, take a deep breath. The hard part, realizing this fact, is over. You have already changed yourself just by taking the leap to the truth. The process can be overwhelming and perhaps a little traumatizing; nobody wants to realize that the issue lies with them. Yet, it happens, far more often than people want to admit. I have a few things you can do to make the process of change and healing easier for yourself. 1. Feeling guilt or shame because of your toxicity is proof that you aren’t as bad a person as you think you are. You screwed up. It happens. Maybe it was a tiny screw-up, a royal screw-up, or a long series of screw-ups. And now you are staring your darkness in the face and you are ashamed of what you see. This is a normal response to such a situation, but more importantly, it’s proof that you haven’t lost yourself as much as you think you have. It means that there is still a part of you that can respond in a constructive way to the world around you. It’s proof that you are still you, even though you are lost at the moment. 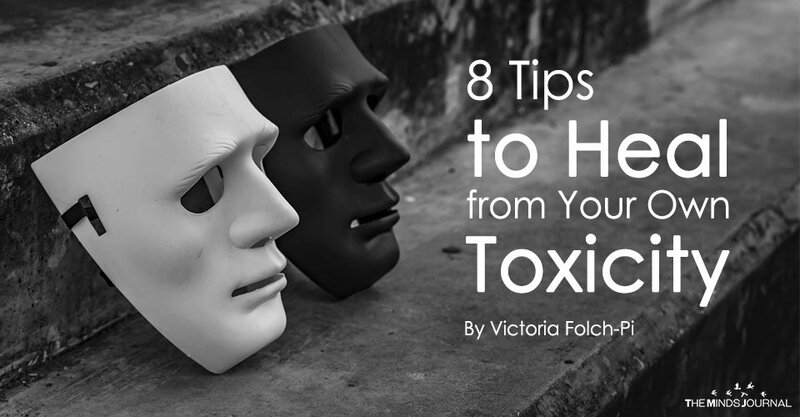 Figuring out you are the toxic one is a rude awakening. Up until now, you could claim ignorance, but now you are aware that the issue lies with you. You have a responsibility to hold yourself accountable for your behavior, past and present. But there is a gift behind this lesson; your self-awareness will expand so that you will have a healthy level of observation with yourself that you didn’t have before. Healthy analysis of your behavior and your person is important. Notice I said analysis, not obsession. Holding yourself responsible does not mean being hard on yourself for every mistake you make. Yes, you have been toxic in the past, but that doesn’t mean that every small mistake you make means you are a bad person. You aren’t toxic because you are late for work or you don’t park close enough to the curb. And you aren’t toxic if you snap at someone because you are stressed (though this is a situation where taking responsibility is important). Before you realized your toxicity, you hated everyone. Guess what? Turning that hate on yourself won’t help anything either. We’ve been talking about self-awareness, so now you need to ask yourself why you were so angry at everybody else in the first place. The answer, most of the time, is due to a deep, inner belief that you don’t deserve love. But if you are capable of loving people and even characters that are flawed and lost, why don’t you deserve that same love? Loving yourself does not mean you are excusing your behavior, but allowing yourself to move past it.